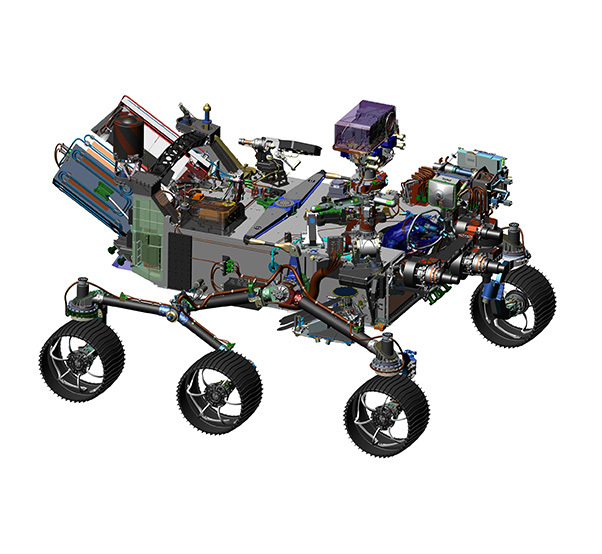 This image is from computer-assisted-design work on the Mars 2020 rover. The design leverages many successful features of NASA’s Curiosity rover, which landed on Mars in 2012, but also adds new science instruments and a sampling system to carry out new goals for the 2020 mission. Two science instruments mounted on the rover’s robotic arm will be used to search for signs of past life and determine where to collect samples by analyzing the chemical, mineral, physical and organic characteristics of Martian rocks. On the rover’s mast, two science instruments will provide high-resolution imaging and three types of spectroscopy for characterizing rocks and soil from a distance, also helping to determine which rock targets to explore up close. A suite of sensors on the mast and deck will monitor weather conditions and the dust environment, and a ground-penetrating radar will assess sub-surface geologic structure. Once a mission receives preliminary approval, it must go through four rigorous technical and programmatic reviews – known as Key Decision Points (KDP) — to proceed through the phases of development prior to launch. 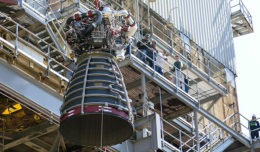 Phase A involves concept and requirements definition, Phase B is preliminary design and technology development, Phase C is final design and fabrication, and Phase D is system assembly, testing, and launch. Mars 2020 has just passed its KDP-C milestone. The Mars 2020 mission is part of NASA’s Mars Exploration Program. Driven by scientific discovery, the program currently includes two active rovers and three NASA spacecraft orbiting Mars. 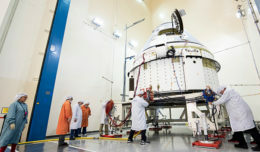 NASA also plans to launch a stationary Mars lander in 2018, InSight, to study the deep interior of Mars. JPL manages the Mars 2020 project and the Mars Exploration Program for NASA’s Science Mission Directorate in Washington, D.C.
For more information about Mars 2020, visit http://mars.nasa.gov/mars2020.